It’s been a long time since I’ve actually posted here. I’ve been in a knitting (and thus, blogging) funk. But this year I have decided to try to fix both of those things. But, none of my knitting of late has been making me, well, happy. And what’s the point of knitting if not for the zen and happiness of it? So I’ve been struggling along for weeks, trying to find the perfect project. And then my husband said that he thought he should buy himself a Jayne Hat . To which, I said, “I can knit that!” And so I am. In all the years I’ve been knitting, he’s only affected a mild interest (to keep me happy) and has never asked me to make him anything. So, he finally asked for something, and I said I could do it. And I can, really… except this particular hat has been subject to much opinion and debate as to how it’s made. I am following this pattern, but am finding the analysis of the hat on this site to be most helpful. Of course there is some debate about the actual color of the hat, because it is often seen in deep shadow. But I see it as a sort of pumpkin-orange and goldenrod, with brick red earflaps. With two strands held together and a combination of colors from the stash, and adding a couple of other shades with the help of a store credit from The Loopy Ewe, I think I will be good to go. 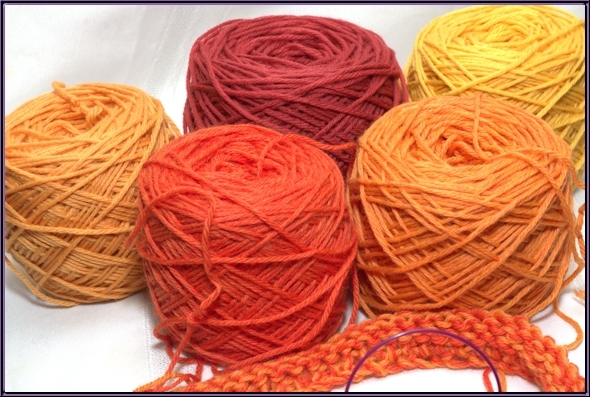 What do you Firefly knitters think of my color choices? As you can also see, if you’re visiting this blog, I’ve done a bit of work here, too. I’ve decided that this is the year I’m going to really focus on my photography skills, so I wanted a blog format that would allow me to easily build photo pages. And this one called out to me. I’ll be building my photo galleries over time, but you can check them out, here: Photo Galleries. For tonight’s photo of the yarn I experimented with my flash. I generally hate flash photography because of the washed out colors and harsh shadows I usually get. But, since my whole house now is full of energy saving (but ugly as sin) fluorescent light bulbs, I figured I’d better start making friends with the flash. So for this photo I mounted the flash on the camera, but added a Gary Fong Universal Lightsphere diffuser, to cut down on the harsh shadows. Not bad, eh? And the yarn colors are accurate and vivid. Of course I am a bigger fan of natural light, but when none is available, this setup might just do. 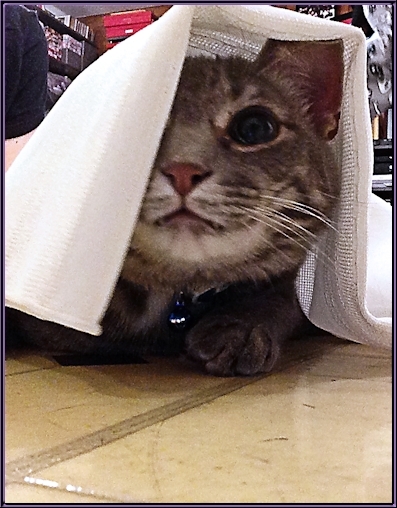 Clyde had run under the chair where I had set up for photos, and got himself draped in the sheet I use for a backdrop. And stayed there, at least long enough for my daughter to snap a few kitty selfies. Never a dull moment around here, I’m tellin’ ya. We’re expecting a boatload of snow tomorrow so I’m hoping that means lots of knitting. Stay tuned for Jayne Hat updates.